One crucial assumption on the minimal naming game model is that all agents have infinite capacity of memory, or practically sufficiently large volume of memory, for storing all words that they learned. However, in reality this may not always be the case. Information overflow due to lack of sufficient memory is common in real-world systems such as various communication networks. 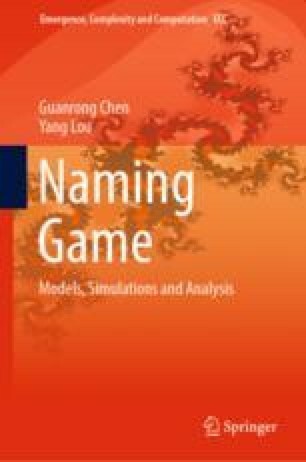 In this chapter, the finite-memory naming game (FMNG) model  is introduced. Agents in FMNG have finite volumes of memory, and the memory size of each agent is determined beforehand. FMNG takes the bounded rationality of agents into account and mimics the situation that there are only finite capability and resource for information storage in the game system. The process of FMNG works under the same framework as the minimal naming game, except that each agent has a limited memory capacity.